I had no idea that it was coming, but in part thanks to the sales success of the two recent Green Lantern-themed reprint issues of DC SPECIAL, the company brought back one of their best-regarded titles: GREEN LANTERN/GREN ARROW. As Green Lantern had become my second-favorite DC hero, this was welcome news. I was less enamored of Green Arrow in general, but had no particular objection to his inclusion, strange as it was given the galactic nature of most Green Lantern adventures I had previously read. 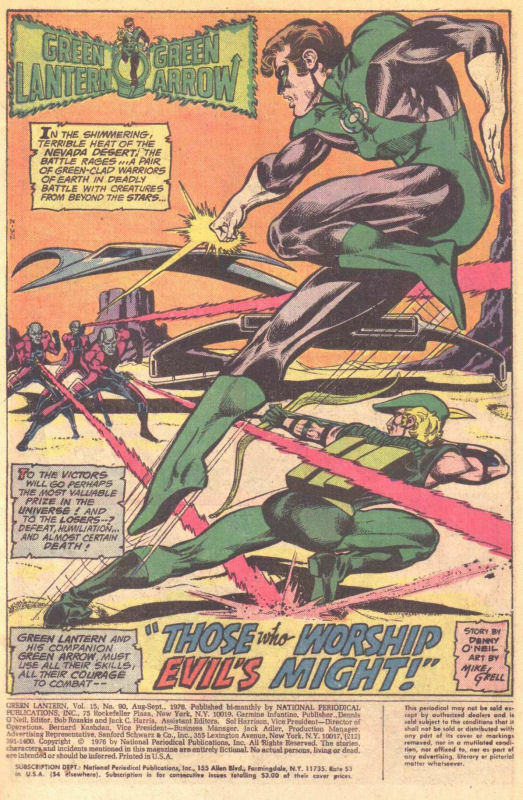 The series was written by Denny O’Neil, who had made the combination of Ring-Slinger and Emerald Archer a point of pride in the past by telling stories about contemporary issues. This “relevance” movement had been a huge boom-and-bust cycle in the years just preceding my entry as a comic book reader, and still held a formidable legend in memory, at least as much for the hyper-realistic artwork of Neal Adams. Stepping in for Neal in this new series was Mike Grell. Of all the projects Grell worked on, I think I like his Green Lantern the best. His work was at once modern and dynamic, and yet still classic. He made both heroes in this title look their best. This issue, while numbered #90, was effectively a new beginning, and so had to espouse on everything you needed to know about Green Lantern. It opens on the planet Oa, homeworld of the Guardians of the Universe, the creators and overseers of the intergalactic Green Lantern Corps of emerald warriors. Here, they provide GL and his fellow with new and improved Power Rings (a new design that will be used for years to come). Grell has some fun by making one of Hal Jordan’s fellow GLs a Mister Spock-esque Vulcan, complete with Live Ling And Prosper hand gesture. But GL has an appointment on Earth, one that he intends to bring his ally Green Arrow along for. Seems recent atomic testing has unearthed a long-dormant spaceship in the desert outside of Las Vegas. Rather than tamper with it themselves, the military has called in Green Lantern and Green Arrow to investigate. First, though, GL needs to recharge his Power Ring, as he must every 24 hours. But before he can, the ship opens, revealing a telepathic alien being ruthlessly pursued by a trio of aliens brandishing firearms. GL and GA rush in to defend the alien under assault–and at his request, Green Lantern takes him off-world while Green Arrow mops up the remainder of his pursuers. 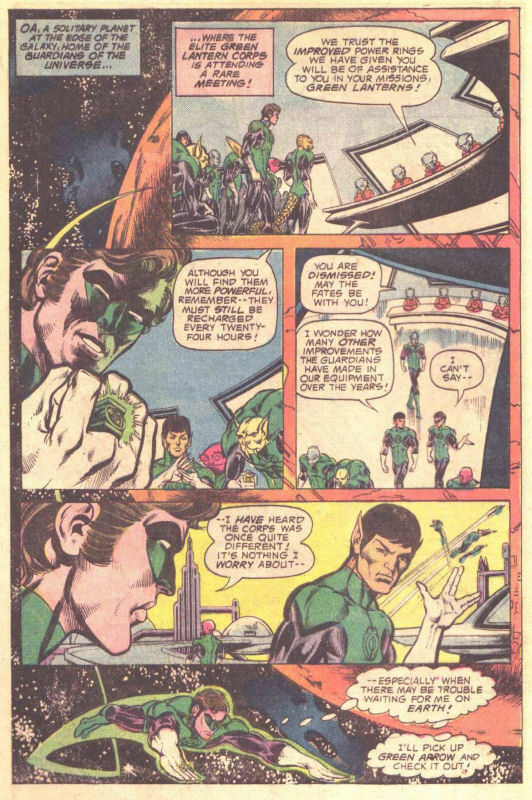 In space, the alien directs Green lantern to take him to Callisto, one of Jupiter’s moons. There, he guides GL into a yellow-hued series of caverns, claiming that he will reveal to the Emerald Crusader the reason he was being pursued. But the Lantern still hasn’t recharged his Power Ring, and the zero hour is growing near, so he materializes his invisible Power Battery to perform that duty. But as he moves to do so, the alien clubs him from behind, intending to steal the battery. 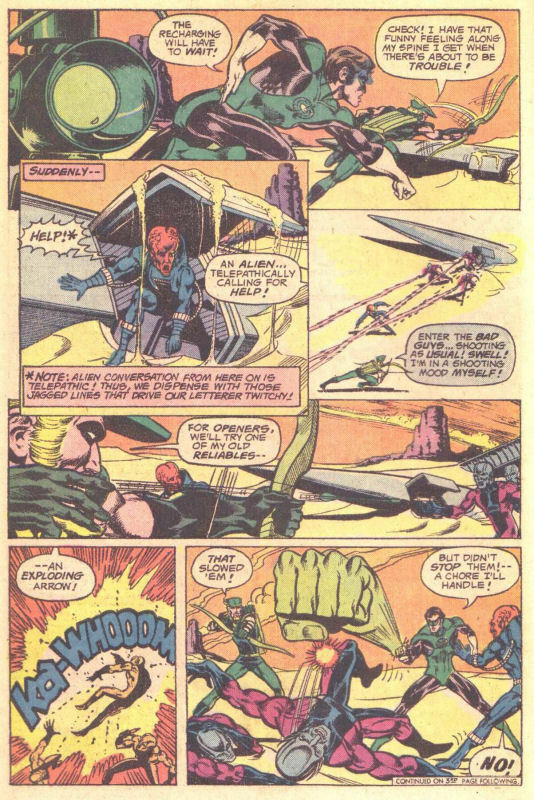 Meanwhile, back on Earth, Green Arrow questions the alien’s attackers. They identify the alien as Jinn, a ruthless space criminal who had stolen their Power Battery, and identify themselves as the predecessors of the current Green Lantern Corps. Rather than rings, these guys have stun pistols they recharge from their battery. 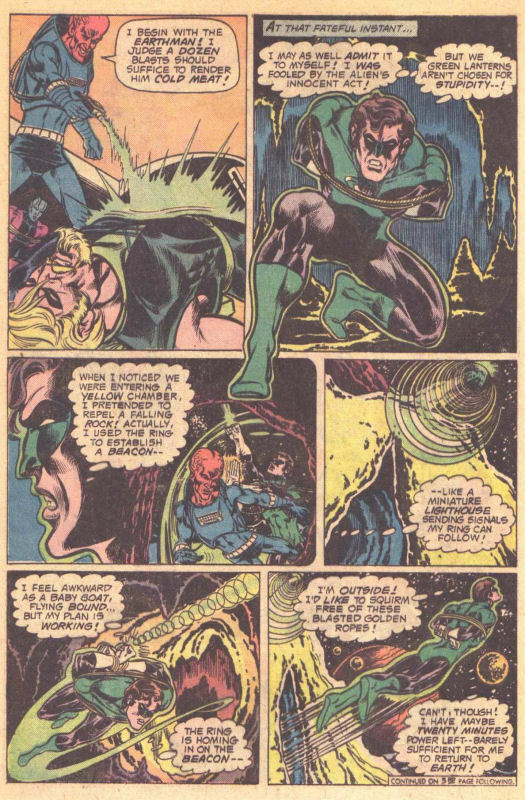 GA moves to release his captives, but then Jinn returns, claiming that he has killed Green Lantern, and attacking Green Arrow and the lawmen from the past. 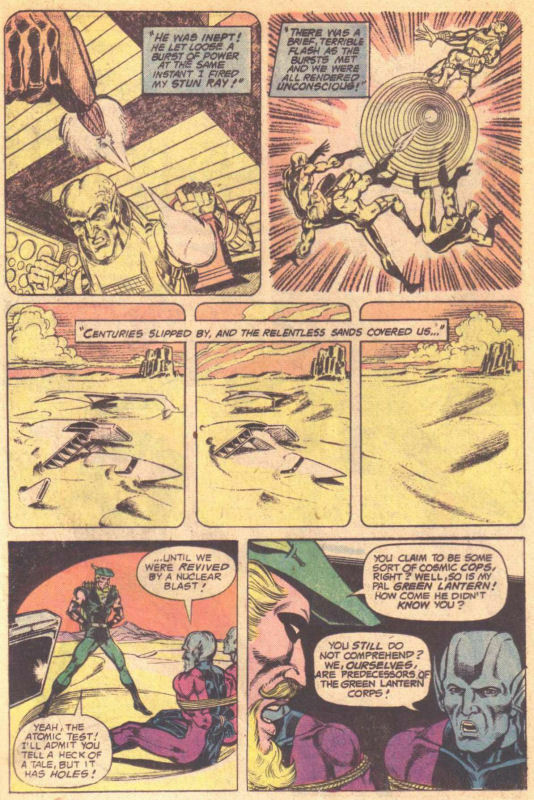 Back on Calisto, Green Lantern is bound and lost within the golden caves through which his Power Ring cannot operate. But having suspected Jinn’s duplicity, he earlier had created a homing beacon that allows him to find his way out of the cave network. 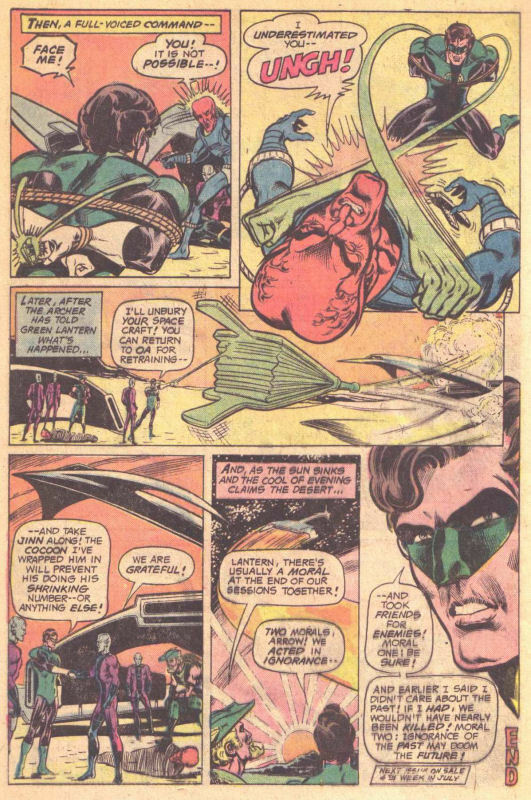 Swiftly he races back to Earth, crashing down with the very last of his ring’s power as Jinn begins to execute Green Arrow and the alien lawmen. Unnoticed by Jinn, the Lantern makes his way to his now-discarded Power Battery, completing his oath and recharging his ring. Then, it’s a simple matter to mop up Jinn and rescue Green Arrow and his fellow agents of the Guardians. And the story ends, as most GL/GA tales of this era did, with an overt statement of morality, in this case about a lack of perspective and history causing the heroes to mistake the good guys for the bad, and to not be so prejudicial in the future. 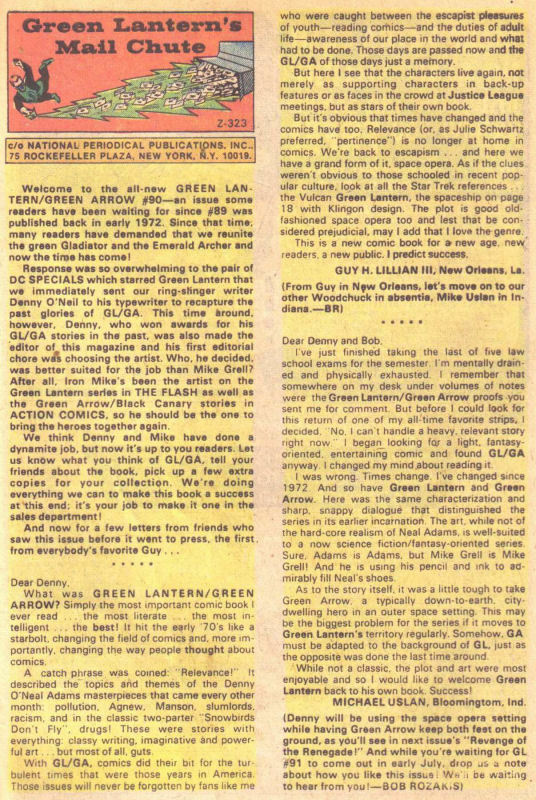 The issue’s letters page, written by Bob Rozakis, contained not only a behind-the-scenes account as to how GREEN LANTERN/GREN ARROW was brought back, but also a pair of advance review letters from a pair of regular correspondents–including Michael Uslan, who had interned at DC and who would go on to license the film rights to Batman, becoming the Executive Producer of all of the future films starring the Dark Knight.